A Soluis Group-led consortium has secured £1 million of funding from Innovate UK to develop an Augmented Worker System (AWE), pioneering the use of virtual and augmented reality for the construction industry. The system will enable the intelligent design, construction, maintenance and whole-life value of buildings, supporting construction and infrastructure growth. AWE will also realise significant value from Building Information Modelling (BIM) and will target a 25% reduction in cost, 25% reduction in waste, and increased productivity of 30% for projects. Soluis Group will work with partner organisations that will add considerable skills, knowledge and connections in the industry. These include, Pinnacle Business Solutions, an information systems consultancy; Carbon Dynamic, an innovative world leading modular timber building construction company; two High Value Manufacturing Catapult centres – the Advanced Manufacturing Research Centre (AMRC) and the Advanced Forming Research Centre (AFRC). The consortium will be supported by key industry organisations that will comprise a steering group. These include AECOM, Doosan Babcock, Laing O’Rourke, Autodesk and Microsoft. With the construction sector being a key sector to the UK economy and one with a considerable growth opportunity, the government has been investing through its Digital Built Britain (DBB) programme. Through the implementation of DBB, the industry will be able to deliver faster builds to a higher quality with fewer defects and more sustainable buildings. The challenge for industry is meeting the DBB Building Information Modelling (BIM) level mandated by the UK Government. The Augmented Worker System will provide the construction industry with augmented and virtual reality to improve the construction process at every stage, meeting these standards. Business Secretary Greg Clark said: “Research and innovation are at the heart of the Government’s vision for a modern Industrial Strategy. 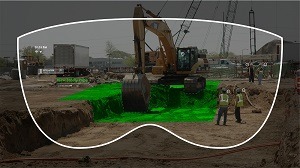 The adoption of cutting-edge virtual and augmented reality technology in industries like construction will be vital in helping us identify new, smarter ways of working. Lead partner in the awarded consortium, Soluis Group, is a leading construction visualisation company that has pioneered the application of realities technology, including development of an augmented reality asset management tool, In-Site, that was piloted at Crossrail’s Liverpool Street station with Laing O’Rourke. The AWE system will be designed to drive greater certainty, safety, efficiency and sustainability through five key areas – co-design, digital job guidance, progress monitoring, safety guidance and asset management. This will allow jobs to be delivered on time, and within budget, whilst also giving a greater level of collaboration and communication between teams and partners on projects. Reducing the need for paper or mobile based handheld devices, gives workers a hands free, heads-up solution for a greater level of safety whilst providing real-time visualisation on-site. The funding was awarded by Innovate UK as part of Infrastructure Systems competition which aims to stimulate innovation that creates UK business growth in infrastructure systems. The project will launch on September 1st with a kick off meeting attended by the consortium companies. Soluis Group has been innovating the interface of high-end visuals and proprietary software and apps that are at the centre of the current wave of BIM adoption in the UK. Soluis focuses on making BIM accessible and understandable to stakeholders of all description and recent work in virtual reality and augmented reality has created exciting possibilities for user immersion in unbuilt architecture and industrial design. The University of Strathclyde’s Advanced Forming Research Centre (AFRC) is a globally-recognised centre of excellence in innovative manufacturing technologies, R&D, and metal forming and forging research. The centre is part of the UK Government’s High Value Manufacturing Catapult and is the only centre of its kind in Scotland putting it at the heart of the country’s manufacturing R&D sector. The University of Sheffield is home to the AMRC, which is a multi-million-pound industry-university partnership which builds on the shared scientific excellence and technological innovation.